This post is sponsored by Bob’s Red Mill. As always, all thoughts and opinions are my own. Thank you for supporting the brands that keep Lively Table running! Anything raspberry always reminds me of my Aunt Debby. She would make homemade raspberry jam every year, and give jars of it out at Christmas time. Her raspberry jam was the best, and it’s what got me into making jam and canning all kinds of things. She passed away a few years ago, but her memory is always carried on by the food she made and taught me to make. 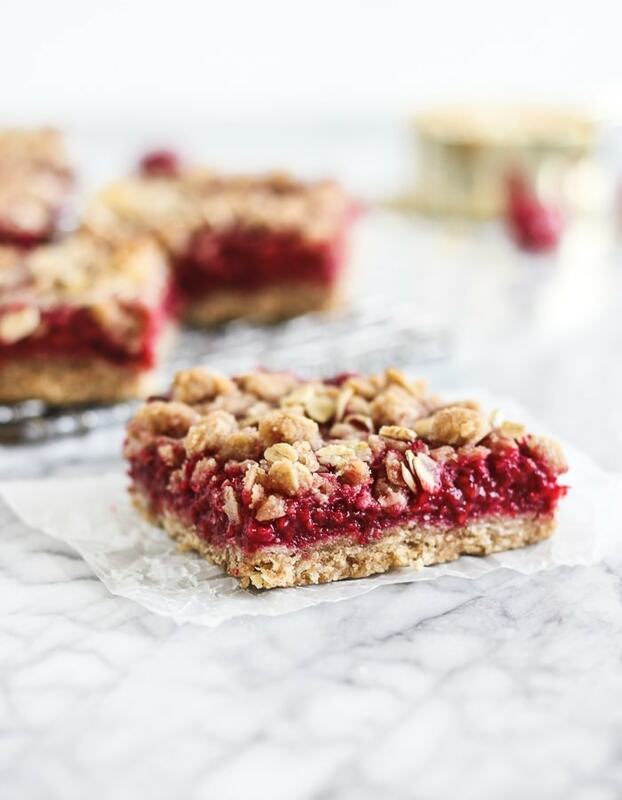 Aunt Debby’s jam would have been delicious in these raspberry oat crumble bars. But since I don’t have any, I did the next best thing in this recipe and used real frozen raspberries for a jammy filling with all the goodness of real fruit! These dessert bars are simply to die for. I can’t decide which part is better, the crumble or the raspberry filling! The raspberry layer is extra thick, since I love plenty of fruit in my desserts. It’s tart and jammy and just sweet enough. But as much as I love the raspberry filling, I’m also a sucker for a good crumbly crumb topping. And made with Bob’s Red Mill oats? The buttery, brown sugar-y oat crumble layers are dessert perfection. 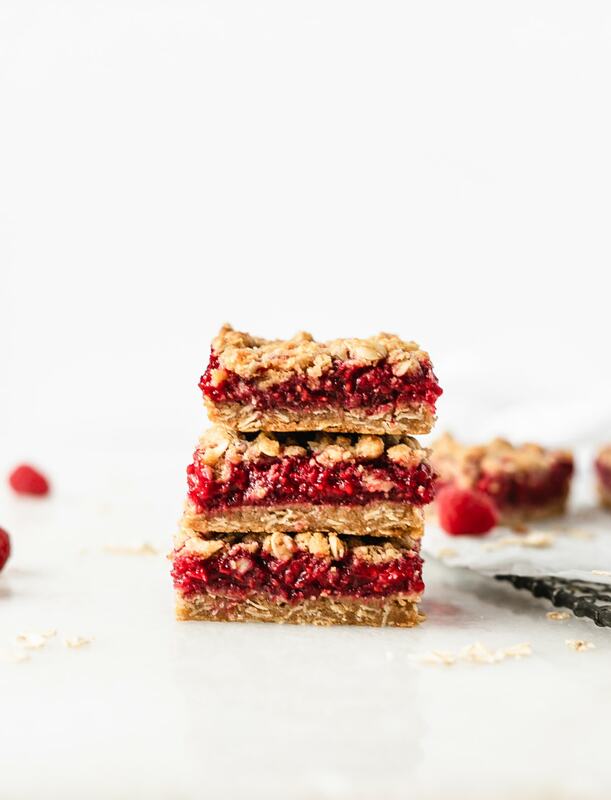 With a solid whole grain base and big chunky crumbs on the top filled with oats, the crumb layers are the perfect contrast to the soft raspberry filling. Good thing we don’t have to choose! 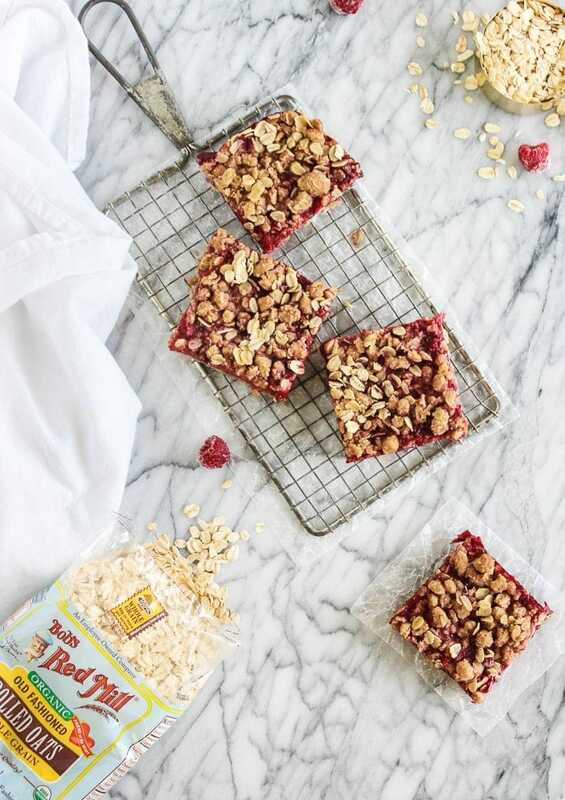 The delicious crumble and raspberry filling together in these heavenly raspberry oat crumble bars make one making one heck of a summer dessert! Want to know a secret? They’re also made with all whole grains. Bob’s Red Mill whole wheat flours are wholesome, deliciously nutty, and light enough for baking with. My favorites are the Ivory Wheat Flour and Whole Wheat Pastry Flour, but even their Stone Ground Whole Wheat Flour is great for baking whole grain treats that don’t taste like it. 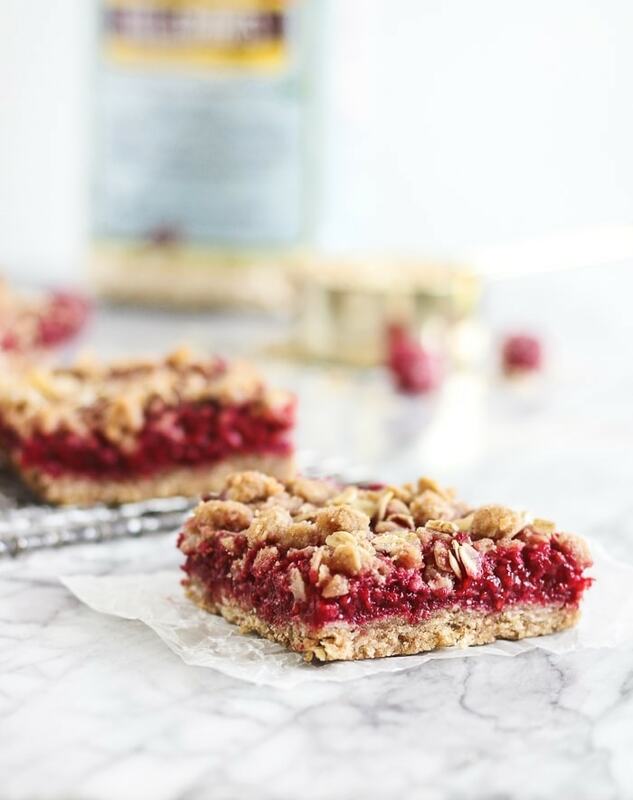 When I shared these raspberry oat crumble bars with my friends, they never suspected a thing. They just loved them! Make a batch of these delicious dessert bars for your next gathering, get-together, or random Tuesday evening. They’re just like summer in dessert form. 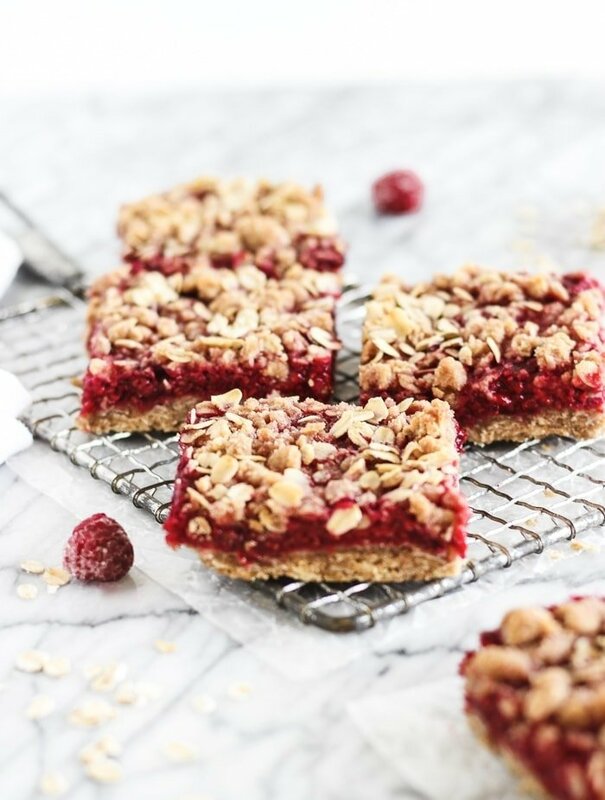 Pure raspberry oat heaven! Place raspberries in a colander to drain until completely thawed. Lightly press with a spatula to release the extra juice. 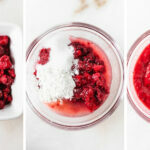 In a small bowl, combine raspberries, sugar, cornstarch and lemon juice. Set aside. Heat oven to 350°F. Line a square 8×8″ baking dish with parchment or spray with cooking spray. In a large bowl, combine brown sugar, oats, flour, baking powder and salt. Add almond extract and melted butter. Stir until the dry mixture is completely moistened. Reserve about 3/4 cup of the crumble mixture for the topping, and tightly press the rest into the prepared baking dish. Bake for 10 minutes. Remove crust from oven. Spread evenly with raspberry mixture. Sprinkle the reserved crumble mixture evenly over the raspberry layer. Bake an additional 20-25 minutes, or until edges are set and topping is golden. Remove from oven and let cool for at least 2 hours to set before cutting into bars.